Male black widow spiders destroy large sections of the female’s web during courtship and wrap it up in their own silk. New research published in Animal Behaviour shows that this home-wrecking behavior deters rival males, by making the female’s web less attractive to them. Surprisingly, the females don’t seem to mind the destruction. The authors of the study, from Simon Fraser University in Canada, say the males’ behavior could protect the female from harassment, enabling her to get on with parenting. The western black widow spider – Latrodectus hesperus – is native to western North America. Female black widows are around 15mm long and black, with a distinctive red hourglass-shaped mark on the abdomen. The male is much smaller, and a lighter tan color with a striped abdomen. Black widows build messy webs, which they use to communicate via vibrations and pheromones. 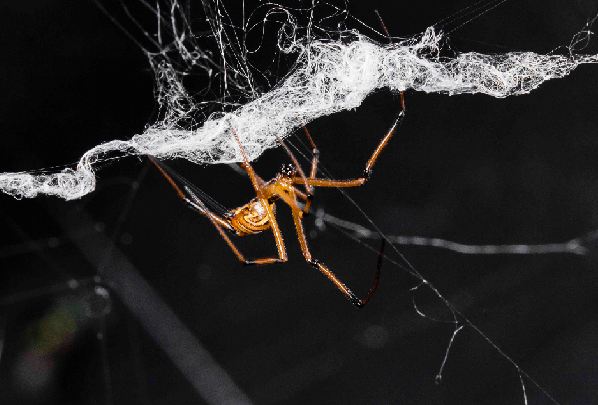 Competition for females is fierce: as many as 40 male suitors may arrive at a female’s web in one night. Because of this, males have developed ways to fend off the competition, such as guarding females and applying mating plugs. The new study shows for the first time in the wild that destroying the female’s web is one such behavior, as it makes the web – and therefore the female – less attractive to other males. The researchers let female western black widow spiders build webs in cages in the lab over the course of a week, and then took those cages to a beach on Vancouver Island where the spiders are found naturally. They removed the females from the webs, and compared the number of wild males arriving at cages containing three different kinds of web: intact webs, webs with about half of the silk cut out and bundled up by males, and webs from which half the silk was cut with scissors and removed. The aim was to see if removing half of the pheromone-laden silk is what made webs less attractive, or whether wrapping the destroyed sections in males’ silk was also important. The results showed that the female’s webs were highly attractive: in the first six hours, some intact webs had attracted more than 10 males. The webs that had been reduced by male spiders attracted only a third as many males as intact webs, showing that web reduction makes the web less attractive and reduces the competition. And the webs that the researchers reduced were just as attractive as the intact webs, suggesting it’s more complex than just reducing the surface area of the web. It may seem strange that female black widows tolerate the destruction of their webs; they generally remain passive during web reduction. This could be because the behaviour is helpful to the females, say the researchers. A female only needs to mate once to have all her eggs fertilized, but an intact web will keep sending out attractive pheromone signals to potential mates for another week. Web reduction could actually be saving the female from being harassed. Web reduction behavior in a male western black widow spider. He cuts the web and then bundles up the cut sections in his own silk. You can see the circling of his last pair of legs – he’s throwing his silk around sections of the web. “Web reduction by courting male black widows renders pheromone-emitting females' webs less attractive to rival males” by Catherine Scott, Devin Kirk, Sean McCann and Gerhard Gries (doi: 10.1016/j.anbehav.2015.06.009). The article appears in Animal Behaviour, published by Elsevier. Animal Behaviour is published for the Association for the Study of Animal Behaviour in collaboration with the Animal Behavior Society. First published in 1953, Animal Behaviour is a leading international publication and has wide appeal, containing critical reviews, original papers, and research articles on all aspects of animal behaviour. Growing interest in behavioural biology and the international reputation of Animal Behaviour prompted an expansion to monthly publication in 1989. Animal Behaviour continues to be the journal of choice for biologists, ethologists, psychologists, physiologists, and veterinarians with an interest in the subject.